Here are a few images of my cottage before I started the work… there were slug trails as you walked into the house - you needed to have an imagination! 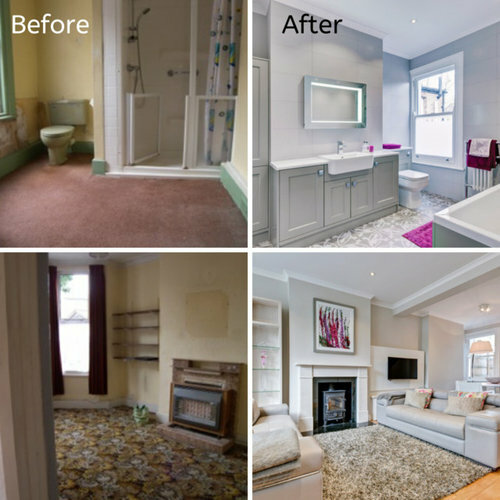 Here's a #renovation tip from this project: Once work commences don’t take it for granted that you can now relax as it will be vital for you to keep on top of things - and to make sure your instructions are being carried out. I would suggest regular site meetings so that you can monitor progress and nip any possible problems in the bud. Wow! What a gorgeous transformation. You’ve made it so peaceful and sophisticated! How long did it take? Just a quick note to thank you all for sharing your thought, ideas, experience and time. I especially want to thank Bluenan and decoenthusiaste for being with me through the all process for the last 6 months or so..., just wanted to post few photos of the results (http://www.houzz.com/discussions/569586/Any-ideas-for-final-touches-to-this-living-dinning) as I feel it is not only me who created this space but it is your creations as much as mine. It may not be perfect or according to the the "Rules", but it is Me and my family. Each and every piece was chosen by me in different parts of the world and each one of them has a unique story behind. I am very pleased with my space. I love it! I am very blessed. .... and so I am off to my new project now... Back to school.... that's really going to be hard ;) Thank you all, once again. Spectacular looking space ... though I am wondering how anyone manages to watch that TV!